Consul installation is very simple. You just need to download the package and extract it. It is a single binary that is executable and that is all you need. The repo contains a Dockerfile that creates an ubuntu image with consul and other command line utilities installed. The docker-compose.yml file will create a local setup containing a consul master and two consul clients. We are keeping it simple with a single consul master node which should be enough to understand the concepts. But for production, single master architecture is not recommended. Go for either 3 or 5 master nodes in that case. The above command will create the image (if not present) and starts the containers in detached mode. It forwards port 80 and 8500 of the host machine to the consul master container. We will be using these ports later on. Let’s first start consul master in consul-master container. Log in to consul-master by executing the below command. Consul package has already been unzipped and placed under /usr/local/bin during image creation. Start consul master by issuing the below command. -bootstrap-expect indicates how many server agents it should expect. In this case it is 1. If you run 3 server agents, then it should be 3. -ui flag indicates we also want the consul ui exposed. We will see how to use the UI later on. Log in to other two containers consul-client1 and consul-client2. To understand how consul is used for service discovery, we will be doing a small demo using nginx. 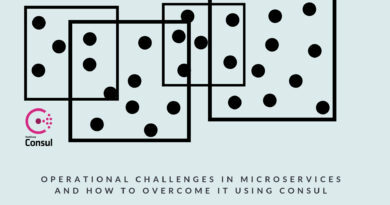 Consul provides two types of interfaces to query for services. One using DNS and other using HTTP API. Since we have already joined our clients with consul master server, we can query for the IP’s using consul DNS. By default, Consul will listen on 127.0.0.1:8600 for DNS queries in the consul. domain, without support for further DNS recursion. The datacenter is an optional part of the FQDN: if not provided, it defaults to the datacenter of the agent. If we know foo is running in the same datacenter as our local agent, we can instead use foo.node.consul. consul-client2.node.consul. 0    IN  TXT "consul-network-segment="
As you can see, we got the IP of consul-client2 in the Answer Section. Next we can try querying for service. But for that we need to have a service registered with Consul. We have nginx installed in all the three containers. Next, we need to register this nginx service in consul. Log in to both the client containers and then create a file named webserver.json under /etc/consul.d/ directory with the below content. We are registering a service with the name ‘webserver’ and giving it a tag name of colour_server. We also specify the port it listens on, which is 80 in this case. 2019/03/21 10:47:17 [INFO] agent: Synced service "webserver"
We have registered our webserver service in consul. Lets see if we can query the service. The tag is optional, and, as with node lookups, the datacenter is as well. If no tag is provided, no filtering is done on tag. Run the below command in any of the server. In this example, I’m executing it from the master. From the output we can see that the dns query resulted in producing two results of the servers that is running the service. We have using +noall and +answer to only give us the answer section and reduces the clutter. webserver.service.consul. 0	IN	SRV	1 1 80 consul-client1.node.dc1.consul. webserver.service.consul. 0	IN	SRV	1 1 80 consul-client2.node.dc1.consul. For this example. 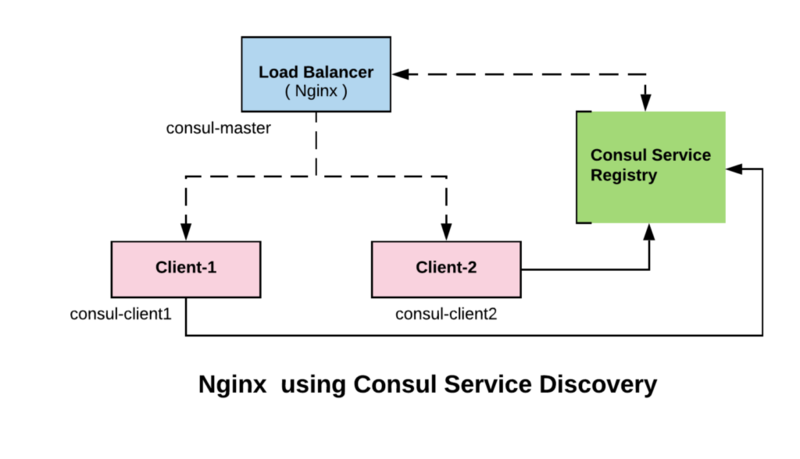 we will consider consul master as the load balancer, which will load balance requests between the two clients based on service availability. We have nginx installed in all the three containers. Let us create a sample index.html to identify which client is serving the request. We have added the resolver tag to resolve queries using consul DNS. The $consulWebserver variable is set to get the values using service lookup for our webserver service. This value is then passed to proxy_pass. Now lets add an health check to the webserver service we created in the previous step. We have added a check that tries to fetch the index page of nginx every 3 seconds. If this check fails, the service will be marked as down in consul service registry. webserver.service.consul. 0 IN SRV 1 1 80 consul-client2.node.dc1.consul. After stopping nginx in consul-client1, a query to webserver service shows only one client instance is available out of two. For our example, instead of making changes to /etc/nginx/sites-available/ we can use that as template and render it dynamically when a new service gets added or removed. It’ll be clear what we mean by this, once you go through the next steps. Next update the template file to render the values we need by using consul API. We will be using go templating for this. We have added a new section called consulWebservice that will be used as an upstream server. The config for consulWebservice upstream server will be populated dynamically using consul API. We use range service to loop through list of all services that are available as part of ‘webserver’ service. We then extract the Address and Port from each item. Later we use this upstream server as proxy_pass endpoint. Once we have created the template, next step is to run the consul-template daemon. Both consul and consul-template has been installed as part of our bootstrap process while running docker-compose. The first value of the template flag indicates the location of the template file. The second value indicated to which destination file it should be applied to. The third value indicates what should be done after applying the changes. In this case we are reloading the nginx. Upstream server should now contain the interpolated values based on the result from the API for the upstream. Ningx will now balance the load evenly between the two servers. We can test that by running the below command in any of the server. Consul KV store is used for storing service configuration or other metadata. 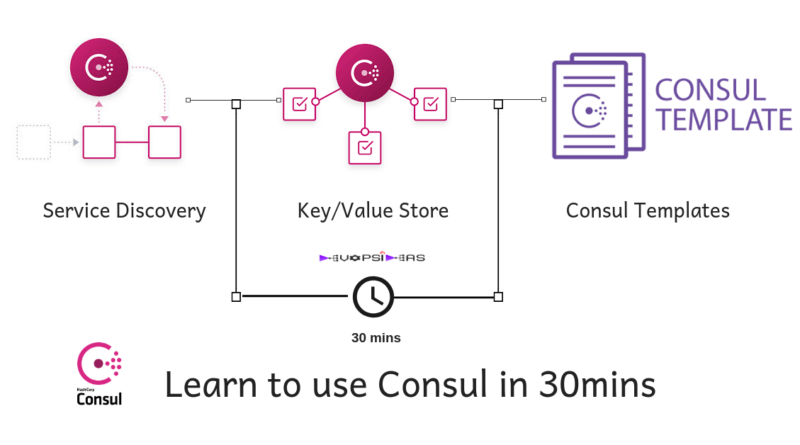 In this we will see how the key value store of consul can co-ordinate and configure parts of our service. We will also see how to use the web-ui of consul. First, let us add a Key called numWorkers for both consul-client1 and consul-client2 with a value of 4 and 2 respectively. We will use it in our nginx default conf file to set weight for each server. The KV store can be accessed by the consul kv CLI subcommands, HTTP API, and Consul UI. You can try exploring the ui by navigating through various options. We can also use consul kv CLI commands to access KV Store. As you can see, we have added an additional configuration weigth that gets the value from the KV store. keyOrDefault will check for the presence of a key. If the key is not present it’ll assign default value. The key we have added is in the format, <node-name>/numWorkers. Hence we are using the print statement to get the node name followed by the corresponding key name. Once the template is loaded successfully, we can verify if the correct value got added for the weight argument we added as part of upstream. We can see the values of weight got populated automatically and it is same as what we set in the KV store. Consul KV store helps us to make changes in the config on the fly. There are numbers of use case with consul KV. For example, you can use a key as a flag to set maintenance for all your webservers or access a specific version of your application, etc. We can test if the load balancer balances the load based on the wight we have set. 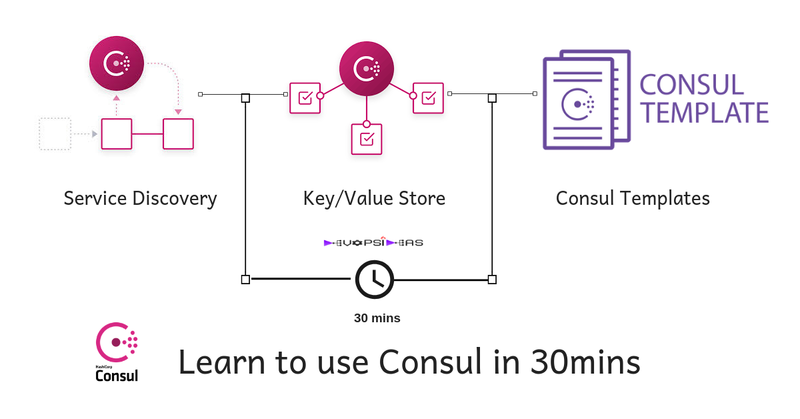 In this startup guide for Consul, we learnt how Service Discovery, HealthChecks, Templates and KV Stores features can be used in Consul. Please post your questions or suggestions in the comment section below.